I do love reading an annual. It reminds me of my grey cocker spaniel. It's better off dead. When it got hit in the head. By Black Hand's darkly hued manual. Most probably cobbled together by Writer: Geoff Johns; Artists: Ethan Van Sciver and Pete Woods; plus Publisher: DC Comics in August 2012. Well I think it was them, anyway. A mate of mine once tried to grow a tree out of head-ache tables, because he thought that this new creation of his would be able to cure the world. Very misplaced actions, I'm sure that you'll agree. Misplaced -- just like some of the cretins in this prologue to 'Rise of the Third Army'. Well, imagine if you will, you're a blue immortal dwarf wearing a red dress, and you and your 'brothers' want to create a 'third army' because in your eyes you're previous two have failed to protect the Universe. So how do go about this, huh? Visit your immortal half-brothers? Give them a slap? And then steal the 'first lantern' that they protected for the power within? Yes. Why not. Seems do-able. But wait! Just after you and your bros carry out these tasks, you notice out of the corner of your eye, Hal Jordan and Sinsestro in a battle with the Black Hand! Now you can't have that now, can you? Two of them have to die, whilst the other one will have be contained. Just not the ones you might think. To be continued as soon as the 'Third Army' rises. 'We believed emotion to be the weakness that led to chaos when we built our first army -- the Manhunters. But without emotion there was nothing to stop them from slaughtering an entire sector. We believed fear to be behind chaos when we built our second army -- the Green Lantern Corps. We have witnessed that chaos comes not only from fear, but also rage, hope, love and beyond. Every corps has become a source of conflict. 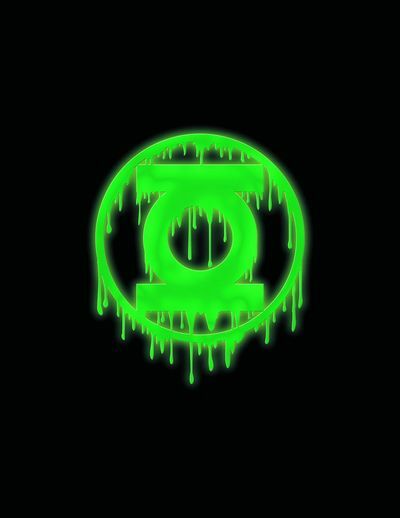 And our Green Lanterns have only exacerbated it'. See? It's almost as if they cannot see it's their own perception that is at fault here, not external forces. Nice piece of dialogue though. Personally speaking, I liked the way that this tale was an intertwined story, which incrementally got bolder and better the more it progressed. Also, I did enjoy the scene where the Guardian first encountered their 'brothers'. It was a very nice touch I thought, and gave this tale some much needed 'historical scope'. If you have visited the DC Comic website recently then I'm sure you partly knew what was going to happen in this annual -- 'Hal go bye-bye'. Though the way in which he 'go bye-bye' makes it blatantly obvious he will one day return. This is only a small gripe though, because the majority of this story was a blast. STORY: I've seen someone buried alive in a movie before, but I don't think that I have seen it done in a comic book. Oh! Wait a minute! Yes I have. It was an old issue of Batman, where the Caped Crusader was buried alive by some evil schmuck with a grin. OK, so let me rephrase that again. I don't think that I have seen someone buried alive in a Green Lantern comic book before. There. That's a lot better. And very creative I thought too. Like the way Hal burst out of his grave and was tempted by Black Hand to bring his father back to life. No! Wait a minute! There was this... THUD! ART: No doubt about it, once the 'First Lantern' was finally revealed, I did get a right kick out of seeing him (well, I think that it is a 'him') surrounded by that webbed lighting. Well, not only did it keep me in suspense, but it also gave his prison a very new and moody twist. 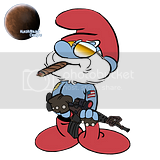 REEGAL: As soon as I saw this Guardian 'homey', I though to myself "La-Lah La-Lah-la Laaaaa La-Lah-La-Lahhhh" You know what I mean, Papa Smurf fans? THE GIRL GUARDIAN WHO SCREAMS REEGALS NAME WHEN HE SNUFFS IT: There is only one female Smurf, isn't there? So who else am I going to choose? Anne Hathaway? I would if the police would release their restraining order! Always Remember That In The Darkest Of Times, There Will Always Be The Greatest Of Emotions. This story had a plodding yet almost Soft Metal rhythm to it, advertently imbuing the overall piece with a journey-esque vibe. Therefore, why not compare it to the Soft Metal theme tune to 'Game of Thrones'. Works for me. Boy-oh-boy! This annual was a really great read. It looked good. The story was engaging. And I did like the way that both plot strands complemented each other in both pace and content. However, I have a small little question that is niggling at the back of my mind. If the Guardians want to protect the universe then that must imply they have some sort of emotion, right? Compassion. Valour. Hope. Whatever. The fact that they want to help the solar system justifies their emotional capabilities. So my point is; they can not eradicate all of the emotions from the galaxy unless they kill themselves as well. Agreed? Also, what is the point of erasing emotions? What does it prove apart from warped logic, which in itself is a reason to prompt the Guardians to question this ploy! Makes sense doesn't it reader?